Last Monday afternoon we decided to get out of the house and visit our local Surestart centre which has a lovely cool room for Messy Play! I always find Surestart have some fabulous ideas for fun, messy play and they are a great resource from which to glean creative play tips! washing dollies in a bath of soapy water. Noah particuarly loved washing the hair of a dolly with very long hair. We don’t have any dollies (unless you count star wars or superhero figures!) so I guess this was a novelty for him. Printing with lots of different shaped and textured objects eg sponges, plastic shapes etc. Our favourite was a car shaped sponge and a tractor shape. Cutting up a white cabbage with scissors. This was something I had never seen before! It is great idea for sensory play though and there are lots of veins to cut along or through. It is also fairly cheap alternative to paper and completly different! Playing with cars in the sand. Sticking coloured rice onto paper. Firstly he drew some patterns with the glue stick then poured the rice over. When he lifted the paper up he was left with the coloured rice pattern he had made with glue. The kids all really enjoyed this activity, particularly mixing all the different coloured rice together! This is the last messy play session before the Summer break and also the last one I will go to with Noah. I can’t believe how quickly it has gone from seeing his “firsts” to doing the “lasts”! 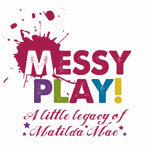 Linking up with Messy Play for Matilda Mae, a fabulous linky in memory of a very special little girl. Today is the day of a charity skydive in aid of the Lullaby Trust, who promote expert advice on safer baby sleep and provides special support for bereaved families. To support the wonderful bloggers taking the leap you can donate to this fantastic cause by clicking here.